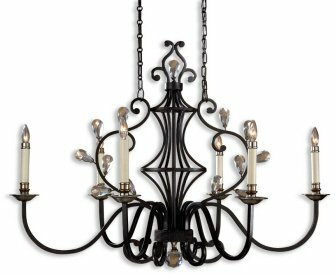 21061 - Uttermost Minuet 6-Lt Chandelier. Detailed and blatantly elegant, this crystal and bronze tone combination is charming and entertaining with its detailed metal scroll work. Fixture Type: Chandeliers. Family: Minuet. Designer: Carolyn Kinder. Number of Lights: 6. Wattage: 60W. Dimensions: 30 H (inches).